Spelling Bee set for May 2nd! 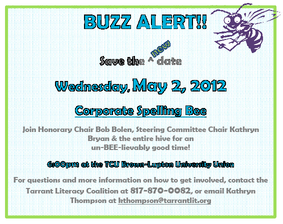 The Spelling Bee date has been changed to May 2nd because our original date may coincide with the Texas political primaries. Please mark your calendars with the NEW date (May 2nd) and get ready for a great evening of fun as we bring together some of the community's most esteemed leaders and best spellers, all to support the important work of the Tarrant Literacy Coalition. If you have not done so already, gather your team together and register for this entertaining and challenging event by contacting Kathryn Thompson today. Watch for more details...coming soon!